You wouldn’t think of heading outside on a cold winter day without a decent pair of boots on your feet to protect you from the snow, sleet and ice – so why should your pooch go barefoot – or rather, barepaw? We know how to protect our hands and feet from the harsh winter elements but we should also take care of our best friends’ extremities. One innovative product that has come up on the pet care market is Pawsh Pads Paw Protectors, which feature a bellows tongue which makes them easy to get on and stay on – which is half the battle for pet parents. 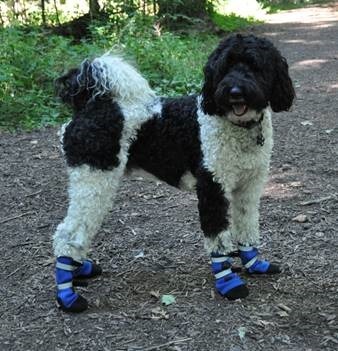 Made out of lightweight, flexible neoprene – the same material as SCUBA suits – these protectors come in a variety of sizes to fit most breeds, ride higher up on the leg and will keep paws dry and free of winter hazards. 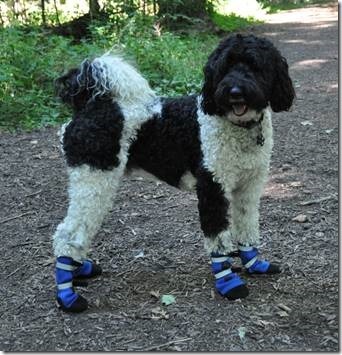 These protectors are so comfortable and will not interfere with walking or running. They come in a variety of colors, which will make your pet the most chic at the dog park and the reflective straps help to promote visibility during those nightime walkies. In extreme winter conditions, paw protectors are a good idea to keep ice and snow balls out of paws that can build up and irritate the pads. Salt and chemical ice melters can also cause chapping, pain and even infection. Salt can get stuck in between your dog’s pads that heat up and can cause burns. Your dog will likely lick his painful paws, transferring the salt to his mouth and tongue as well, and even get into his gastrointestinal system. Other possible physical injuries during the winter include frostbite or abrasions from sharp surfaces on ice and snow. How long your dog’s paws will tolerate the winter elements depends on his breed, age and even personality, but most can be trained to tolerate paw protectors, with some patience and treats! 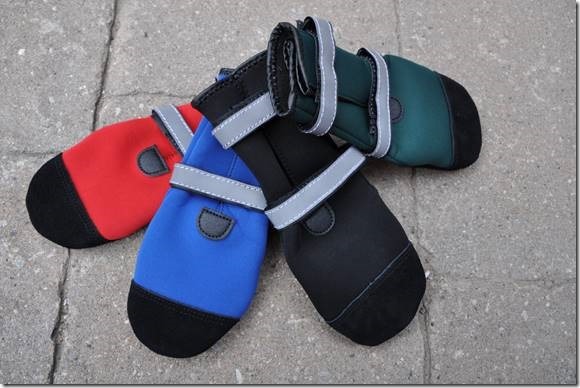 First try the paw protectors on indoors so your pooch can get used to the feel of them, then go out for short, fun walks, full of play. Try to distract your pet with a favourite outdoor activity. When you buy paw protectors, make sure they are properly sized-so that they do not cause sores or fit too tightly, and that the dewclaw is adequately covered and not irritated. You can visit the Pawsh Pads website at www.pawshpads.com for a fitting guide. You and your pup can enjoy your winter walks by both dressing for the weather.